Kino no Tabi Wallpaper: Kino no Tabi: Do you love you? 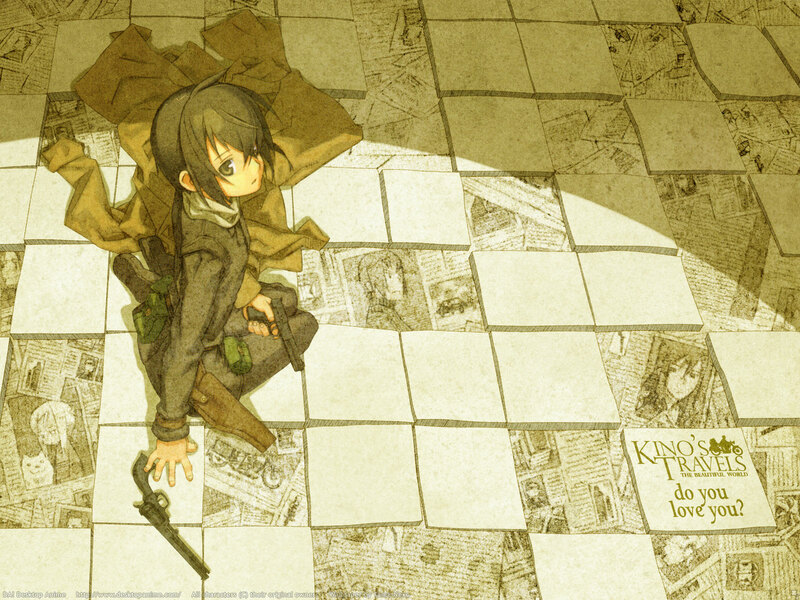 Minitokyo »	Kino no Tabi Wallpapers » Kino no Tabi Wallpaper: Kino no Tabi: Do you love you? So I'm taking a break from my Kino chapter illustration series to bring you this Kino wallpaper. When I got novel 9 I totally fell in love with this image. The overhead perspective, the newspaper clippings with glimpses of other characters (even Tea! ), the pose... all were just wonderful. I basically extracted Kino and her shadow and then proceded to redraw the background so that the vertical layout would fit a horizontal one. The blocks were redrawn in Photoshop. The newspaper clippings were cut out from the original and rearranged to fit the new arrangement. Add the ovular lighting, and some textures, and there you go. After nearly 40 wallpapers using the same Kino logo, I decided to create a new one. It's about time, isn't it? The new logo is a little more compact and incorporates the Kino/Hermes picture in the official logo, and I like the font better as it's easier to read. The title was just the text that was originally on the image. Additional resolutions will be available at DA! Desktop Anime in a short while. This is my 200th wall at DA! As for now i didn't see the original scan but i can't find anything to point out or critic. I love your Kino no Tabi collection since it was you that inspired me to buy the DVD with all your wallpapers. For now i think you did a flawless job. Everythings perfect. And congratulations for your 200th wallpaper. I really enjoyed Kino no Tabi, a series that flies below a lot of people's radars, but I digress. I like the pale colors in this wall, it matches the mood of the series very well. Your Kino wallpapers are always creative and original. Great job on another one to your collection, Tama. man...it looks great...the extension to the scan u made is flawless. The new logo looks nice!~ especially the motorcycle u added. This is really really cool XD Definatly the best wallpaper I have seen in a while! Wowies, awesome, another work of art from Tama-Neko! The background looks really beautiful, great detailing and the texture is really nicely pit together. I like the font on the tile, really matches nicely. Great concept and overall look. Awesome work! Keep it up! I really liked teh atmosphere of the wallie! It's serene but somewhere there's so many tension.... it's hard for me to explain what I felt when I glanced at the image. I think it's r beautiful! Congrats! I simply love everything about this wallie. The grudge look is a great touch to the mood and theme of this wallie. I just simply love it~ And conrats on it being your 200th wallie at DA. I can't really say that I like the texturing on this but it's a wonderful wallpaper nevertheless. Just a difference is taste is all. Your collected skills after making 200 *cringe* wallpapers reflects remarkably well on this. Kudos. Love the colors btw. Great job re-drawing everything. It must have been really difficult. The feel of this wall is very similar to the one from the image, which is what you wanted, if I'm right. It looks really nice overall. I agree with CosmoStar and the atmosphere part. Its really wonderful. And congrats on your 200th wall. I really like the overhead few! The color is really nice too! Awsome wallpaper! your work always its the talk of the town, and this look very awesome like all of your other works as always. great new wally. I like the look/style. So I hope to see soon more of them, but I'm sure that will be so. cu soon, bye. Uhm, nice wall .. I like the background ^^ .. add to favorites. It's very wonderfull, just like the anime! Your walls are abstract, Tama-Neko-chan! The colors are peacefull, the character is nice, & the ground is very nice! Wonderfull job, Tama-chan! I'll add it to my favs+! It's beautiful and as always, creative. Good brain you got there. *_* And yeah, about time you change the logo. I love it this way, good lighting too. Perfect for Windows XP Olive Green theme. ^_^ Nice texture, too. this wallpaper look so awesome ! I like the colour and the background ! You are so awesome with this kind of idea of craeting this. Like way and the style of it. Cool work ! I love it ! Thank for sharing !